“Ooga chaka ooga ooga, ooga chaka ooga ooga” – It makes no sense at all, but if you’re a certain age, just reading the words instantly brings to mind the intro of today’s jukebox classic single! While most people know “Hooked on a Feeling” by its signature “ooga chaka” intro as performed by Swedish group Blue Swede, the song actually had already been a big hit in 1968 when it hit the #5 spot on the charts as recorded by B.J. Thomas. The song was written by Mark James who also wrote Elvis Presley’s “Suspicious Minds.” There was nary an “ooga chaka” to be heard in Thomas’ version of the song, instead, his version featured electric sitar which made it stand out alongside the other records on the charts. So, just where did the famed “ooga chaka” intro come from? In 1971, Jonathan King, who is vaguely remembered in the U.S. by his top twenty hit “Everyone’s Gone To The Moon,” recorded the song and added the “ooga chaka” intro to his version which was based on the Indian chants heard in Johnny Preston’s 1959 chart topper “Running Bear.” King’s cover reached the #23 position on the UK singles charts in 1972. 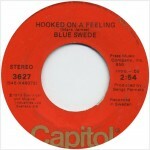 King’s version of the song was heard by Bengt Palmers who was the head of A&R for EMI Records in Sweden who was working with a group called Bjorn Skiffs and Blablus (loosely translated to Blue Denim). Blaubus began performing the song as part of their shows in Sweden for several months before recording it and changing their name to Blue Swede for the US market. Blue Swede formed in Sweden in 1973 by Bjorn Skiffs with members Bosse Liljedahl on bass, Anders Berglund on keyboards, Hinke Ekestubbe on saxophone, Jan Guldback on drums, Michael Areklew on guitar and Tommy Berglund on trumpet. When they came to record the song, they jungled up the “ooga chaka” intro, giving it the hook that took it to the top of the U.S. charts in 1974. They were the first Swedish act to top the U.S. singles charts before ABBA. Most of Blue Swede’s hits were somewhat laughable covers of other artist’s songs. Their debut album of the same name featured covers of Lee Dorsey’s “Working In The Coal Mine,” Dionne Warwick’s “(There’s) Always Something There To Remind Me,” Jose Feliciano’s “Destiny,” Kenny Rogers & The First Edition’s “Something’s Burning” and a version of The Association’s “Never My Love” which reached #7 on the U.S. charts in August of 1974. The album also featured another chart hit in “Silly Milly” which reached #81 in February of 1975. They also covered a medley of Deep Purple’s “Hush” and Tommy James & The Shondells’ “I’m Alive” (#61/1974) and Cher’s “Half Breed,” to name a few more. The flip of today’s single, “Gotta Have Your Love” was also from their debut album. It is a passable soul pastiche featuring lead vocals by Bjorn Skiffs that would not have been out of place on R&B stations during the 1970s. After Blue Swede broke up, Skiffs partook in the cast recording of Tim Rice’s musical Chess along with Benny Anderson and Bjorn Ulvaeus of ABBA. “The Jukebox Series” focused on the 80 records that currently inhabit my 1963 Seeburg LPC1 jukebox. I’ve had my jukebox (or as I like to call it “the prehistoric iPod”) for a little over 14 years and in that time I’d like to think that I’ve perfected the mix of 45s within. Over the years, records have come and gone out of the ranks of the juke, but they were all at one time juke-worthy. I’ve decided to expand “The Jukebox Series” to include many of the “juke-worthy” records that are no longer currently in the mix, but at one time inhabited a coveted slot. Posted: November 3rd, 2015 under Blue Swede, Music, Rock.